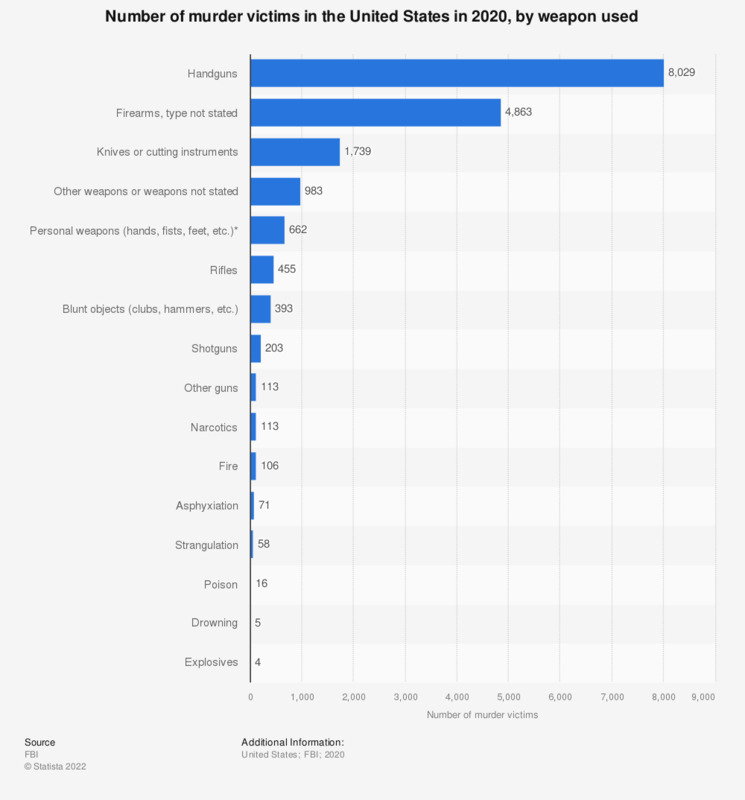 This graph displays murder victims in the United States by weapon used in 2017. In 2017, around 13 people were poisoned to death. Handguns were by far the most popular murder weapon used in the US in 2017. That year 7,032 people were murdered with handguns. Knives or cutting instruments were the second most popular weapon used, with 1,691 murders committed with a knife. In 2013, in most cases, the circumstances under which murders were committed in the U.S. were either unknown or unclear: 6,077 murders were committed due to unknown circumstances and 3,224 murders were committed due to unspecified arguments or disagreements. Robberies accounted for 680 murders in 2017. 32 children were killed by babysitters. 107 lives were ended due to a romantic triangle. Despite these macabre statistics, murder and non-negligent manslaughter accounted for only about 15,000 deaths in 2017. Murder was not within the top fifteen causes of death in the U.S. in 2010. Heart disease and cancer accounted for many more deaths that year. In 2010, about 174 deaths per 100,000 population were caused by heart disease alone. In 2010, 24.9 percent of deaths among men were caused by heart disease. Though rates of heart disease death among women were similar that year, a much smaller share of women died of unintentional injuries than men, only 3.5 percent of women’s deaths to 6.4 percent of men’s deaths. Suicide accounted for 2.3 percent of men’s deaths, while suicide was not within the top ten causes of death for women. About 2 percent more women died of stroke than men. Though the death rate in America has dropped only slightly since 1990 from 8.6 deaths per 1,000 population to 8.07 deaths per 1,000 population in 2011 (195948), the cost of a funeral has risen dramatically since the 1960’s. As of 2006, a funeral cost, on average, 6,195 U.S. dollars. In 1960, the average funeral cost was 708 U.S. dollars. *Pushed is included in personal weapons.